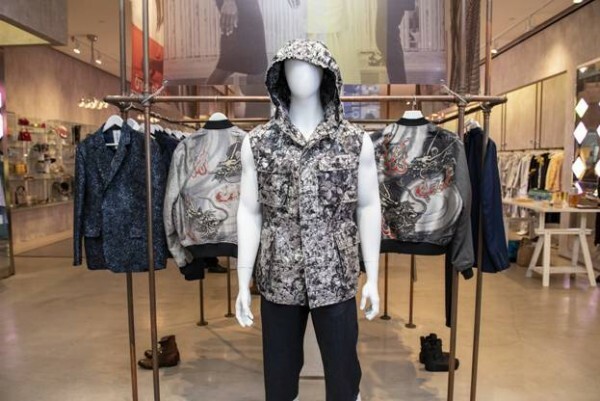 New York fashion brand, HIROMI ASAI, develops men’s wears all made of Japanese Kimono textiles since 2017. Now HIROMI ASAI men’s collection arrives in the prestigious boutique, Flying Solo NYC at SoHo, New York. For Spring-Summer collection, HIROMI ASAI features comfortable and stylish shirts and jackets made of finest Kimono cotton textile, Ise Momen, woven by 100-year-old looms. NEW YORK, NY – April 2, 2019 – New York Fashion Week participating fashion brand, HIROMI ASAI, (www.hiromiasainy.com) has always been trying to revive the essence of Japanese Kimono for modern fashion. HIROMI ASAI develops men’s wears all made of Japanese Kimono textiles, which were presented at Pitti Uomo in Florence, Italy and other major trade shows in USA every season since 2017. HIROMI ASAI men’s wear collection won accolade and got many international media coverage. Flying Solo NYC is a unique boutique located on the prime street at SoHo, New York, which introduces and sells independent and emerging fashion brands, and produces fashion shows to demonstrate the newest collection of the participating brands during New York Fashion Week and Paris Fashion Week. During the recent New York Fashion Week 2019 Autumn-Winter, HIROMI ASAI presented and sold the representative collection. Because that appearance at Flying Solo NYC met with a favorable public response, HIROMI ASAI decides to sell the collection continuously at Flying Solo NYC, starting in the beginning of April, 2019. In addition, HIROMI ASAI provides collection samples to stylists and editors at the show room of Flying Solo, The Copper Room. For the spring-summer collection, HIROMI ASAI presents comfortable and sophisticated shirts and jackets, made of finest Kimono cotton textile, Ise Momen. Ise Momen has more-than-350-year history, woven by 100-year-old looms. HIROMI ASAI asks this workshop to weave premium cotton textiles for the collection with unique but modern patterns. All these clothes were tailored with highest quality by Sanyo Industry Inc. and Fashion Kobo Kuroishi in Japan. Subsequently, HIROMI ASAI is planning to present various men’s collection including jackets, suits, vests, shirts, pants and ties, all made of various Kimono textiles, woven and dyed at workshops all over Japan. HIROMI ASAI will demonstrate the newest men’s wear collection on runway during both New York Fashion Week and Paris Fashion Week with Flying Solo NYC in autumn, 2019. HIROMI ASAI appears in April 1st, 2019 at both sites. Hiromi Asai is a New York-based fashion designer. Hiromi Asai established New York based fashion brand, HIROMI ASAI, in 2016. HIROMI ASAI creates simple and sophisticated styles, all made by finest Japanese textiles, which are produced by traditional Kimono manufacturing techniques. HIROMI ASAI first presented a womens wear collection on the runway during 2016 Fall/Winter New York Fashion Week. HIROMI ASAI expanded her collection to menswear and debuted the first menswear collection at Pitti Uomo in January, 2017. HIROMI ASAI presented men’s collection at Pitti Uomo in Florence, Italy and at Capsule Shows and Liberty Fairs in New York and Las Vegas since 2017. HIROMI ASAI collections were covered by international media including NBC News, Newsweek, AFP, and SOMA Magazine. Be the first to comment on "HROMI ASAI Men’s Collection Made of Kimono Textiles Arrives in the Boutique at SoHo, New York"